The company used the opportunity to reward 125 journalists who participated in an endurance test to kick-off this year’s Gulder Ultimate Search, which begins in September. Mr. Nicolaas Vervelde said that the new poster was about 5,367 square metres and has already gone into the Guinness Book of World Records after beating the current record of 4.7m achieved in Kochi, India earlier on June 27, 2015. 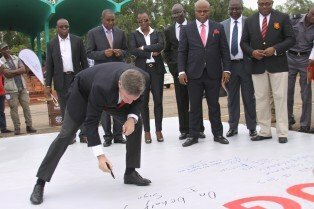 Mr. Vervelde then recalled with affection that Enugu and the South East region has always played an important role for the company, starting with the Aba brewery that was built in 1957. The Southeast, he said has been a solid base to its operations and veritable home to its brands. “Our investments in the region have been that 4 of our 11 breweries are sited in the region (Aba, Awo-Omamma, Onitsha, and Ama). He added that the company has the largest Sorghum malting plant in Africa sited in the region. Since the first Gulder rolled-off the line in 1970, as Nigeria’s first lager beer packaged in a brown bottle, Gulder has blazed so many trails. It was the first beer to be packaged and sold in cans. In 2014, Gulder was re-launched in a re-engineered beer bottle with a proud gold neck foil and bold shoulder-embossment, complemented by a new metalized body label with double side embossment. At the unveiling of the poster, Enugu State Governor, Hon Ifeanyi Ugwuanyi thanked Nigerian Breweries for such an outstanding feat that is coming at the right time when the Rockefeller Foundation had announced Enugu as one of the most resilient cities in the world. I have been drinking gulder since i was 18 years of age and now am 38 i have loyal to gulder and i want to get a reward for it.my friends have been mocking me on long loyalty to gulder and i believed one day i will really have something to show for it.